1. Turkish Journal of Pathology (http://www.turkjpath.org)(ISSN:1018-5615 / E-ISSN:1309-5730) is the official journal of the Federation of Turkish Pathology Societies. The Journal is a peer-reviewed scientific journal published every four months, three times a year (January, May, September), and aims to reach all relevant national and international medical institutions and persons in electronic versions free of charge. Articles in English are welcomed. 2. 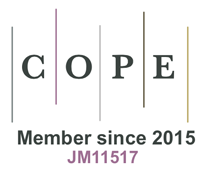 The Journal is devoted to the continuing education of national and international practicing pathologists, and to provide a forum for social and scientific communication in the field. Studies that emphasize these aims provide the basis of publication, including original articles, case reports, reviews, abstracts from annual meetings, letters to the editor, book reviews, biographies and articles with social content. The Turkish Journal of Pathology accepts only invited review articles. 3. A submitted article must not have been previously published in print or electronic format and must not be under consideration for publication at another journal or electronic media, and, if accepted, must not be published elsewhere in any languages in a similar form. Articles presented at a meeting or symposium or in electronic form are accepted if this is stated. The Turkish Journal of Pathology accepts advertising for products and services that are of interest to users professionally. The decision of acceptance is subject to consultation with the journal's editorial team. The editorial team reserves the right to accept and reject advertising proposals. The sources of income of the Turkish Journal of Pathology include institutional support (Federation of the Turkish Pathology Societies) and display advertising for pharmaceutical and nonpharmaceutical products. 4.Accept responsibility for the appropriate analysis and resolution of questions related to the integrity and accuracy of a section of a study and for all aspects of the study. For multicenter studies, all declared authors should meet the above authorship criteria. Contribution such as searching for and finding financial support for the study or only collecting data or general help and guidance for those conducting the study do not confer the right to authorship. Individuals who have contributed to the study but do not meet authorship criteria can be included in the "Acknowledgements" section after their consent is obtained. The author order should be the joint decision of all authors. The editor can ask the individual contribution of each author and may find it appropriate to publish this information to prevent an unnecessary increase in the number of authors or unfair academic or similar benefits. Authors are responsible for their articles' conformity to ethical rules. The study protocol for human experimentation must conform the ethical guidelines established in the World Medical Association Declaration of Helsinki (http://www.healthscience.net/resources/declaration-of-helsinki/). Therefore, all articles submitted for publication must specify that the ethic standards of the above committee were adhered to. Any necessary permission documents from local and international ethic committees must also be sent with the article. Authors must specify in the method(s) section that they performed the study according to these principles and that they obtained "informed consent" from their institution's ethic committees and the participants. Articles reporting the results of experimental studies on animals must include a statement that study protocol was approved by the animal ethics committee of the relevant institution and that the study was conducted in accordance with "Guide for the Care and Use of Laboratory Animals" (http://www.nap.edu/catalog/5140.html). Authors must send the approval of the relevant ethics committee with the article. If any previously published quoted passages, tables, figures, etc. are used in the article, authors should obtain written permission from the publication rights holders and the authors, and should specify this in the article. All new submissions are screened for plagiarism by similarity check software (Ithenticate). A conflict of interest is defined as any financial, personal, academically competitive or intellectual relationship between the author, referee or editor that involves article submission, referee evaluation, editorial decision and author-referee-editor correspondence and that could lead to a prejudiced and unfair action during the evaluation stage. The authors must declare any financial relationship or conflict of interest areas that need to be known regarding the study. All financial contributions and sponsorships for the study and all financial relationships and conflict of interest areas should be included in the copyright transfer form that accompanies the article. The authors must explain the study sponsor's role in collecting, evaluating and analyzing the data, writing the article and submitting it for publication. If there is no conflict of interest, this section must include a "The authors declare no conflict of interest" statement. All sources of funding should be mentioned in the manuscript. The evaluation process for the article is not started if a conflict of interest statement signed by corresponding author is not present at the time the article is sent. If a conflict of interest becomes apparent after the article is published, the journal may make an official correction or withdraw the entire article. The referees also need to declare all their interests that they feel may represent a potential conflict of interest. The referees must declare to the editor any conflicts of interest that may prejudice their evaluation of the article and must avoid such evaluation of certain articles if a potential prejudice is present. The editors who will make the final decision on the articles cannot have any personal, professional or financial relationship with any of the authors of the articles they will decide on. The editors will also try to avoid any referees who have a possible conflict of interest, for example those working in the same department or facility as any of the authors. The editors and publisher assume no responsibility regarding features and explanations of any commercial products advertised in the journal. Turkish Journal of Pathology requires all authors to acknowledge, on the title page of their manuscript, all funding sources that supported their work, as well as all institutional or corporate affiliations of the authors that might pose a conflict of interest in connection with the submitted manuscript. Authors should avoid descriptive information such as patient names, initials, reference numbers or photographs in their article. Such information can be published if absolutely necessary for scientific reasons and only after obtaining written "informed consent" from the patient (or parents, or guardian). The article must also state that "informed consent" was obtained. Editors do not share information regarding articles (article receipt, review process, referee opinions or final results) with anyone except authors and referees. Referees and editorial board members cannot discuss articles in a public manner. Editors must send copies of the article to the editor once their review is complete. Referee reviews cannot be printed or disclosed without permission of the author and editor. Care is taken to keep the identities of the referees. In some cases, the editor may decide to send referee opinions on the article to other referees reviewing the same article to inform them during the process. All articles submitted will be subjected to peer review by the editorial board, and the authors will be informed within four weeks. Editorial board reserves the right to make some revisions in the article. Revised articles should also be accompanied by a unique letter with responses to reviewers' comments. Articles that do not comply with the journal requirements listed below may be returned without review at the discretion of the editors. If the journal requests a revision, the author(s) should submit the revised version within six months. Otherwise , it will be considered a new submission. a. Title page: The title page should contain the article title, authors' names, academic titles and affiliations, a running title not exceeding 40 characters and the address for manuscript correspondence including e-mail address and telephone and fax numbers. If the article was presented at a scientific meeting, a complete statement including the date and place of the meeting should be provided. An "acknowledgement(s)" section should be placed on the title page to thank those who helped the study or preparation of the article, if any. All funding sources that supported the work and the institutional and/or corporate affiliations of the authors should be acknowledged on the title page. This section contains statements of gratitude for personal, technical or material help, etc. b. Abstract and keywords: All articles should contain an abstract. Abstracts must be no longer than 250 words. The abstracts should be structured [objective, materials and methods, results and conclusions]. Case reports should also include a structured abstract [objective, case report(s), and conclusion]. Abbreviations should not be used in the abstract. The authors should list three to five key words or phrases taken from Index Medicus Medical Subject Headings (http://www.nlm.nih.gov/mesh/MBrowser.html). c. Text: Original articles should be organized in four main headings: introduction, material and method, results, and discussion. Define abbreviations at first mention in the text and in each table and figure. If a brand name is cited, supply the manufacturer's name and address (city and state/country).Case reports should include the following identifiable sections: introduction, case report(s), and discussion. d. References: References should be arranged according to the "Uniform Requirements for Manuscripts Submitted to Biomedical Journals" rules developed by "International Committee of Medical Journal Editors (ICMJE)". Some examples have been provided for frequently used reference types. The http://www.nlm.nih.gov/bsd/uniform_requirements.html site should be used for guidance on other types of references not provided here. Each reference should be numbered and listed according to their order in the text. They should be referred to in parentheses at the end of sentences within the text. The author(s) are responsible for the accuracy of the references. Journal titles should be abbreviated according to Index Medicus. Refer to the "List of Journals Indexed in Index Medicus" for abbreviations of journal names, or access the list at http://www.nlm.nih.gov/tsd/serials/lji.html. Abbreviations are not used for journals not in the Index Medicus. Only published articles or articles "in press" can be used in references. All authors names must be written, do not use "et al". Authors must add the DOI and/or PMID numbers to the end of each citation. Breedlove GK, Schorfheide AM. Adolescent pregnancy. 2nd ed. Wieczorek RR, editor. White Plains (NY): March of Dimes Education Services; 2001. Meltzer PS, Kallioniemi A, Trent JM. Chromosome alterations in human solid tumors. In: Vogelstein B, Kinzler KW, editors. The genetic basis of human cancer. New York: McGraw-Hill; 2002. 93-113. Christensen S, Oppacher F. An analysis of Koza's computational effort statistic for genetic programming. In: Foster JA, Lutton E, Miller J, Ryan C, Tettamanzi AG, editors. Genetic programming. EuroGP 2002: Proceedings of the 5th European Conference on Genetic Programming; 2002 Apr 3-5; Kinsdale, Ireland. Berlin: Springer; 2002. p. 182-91.
e. Tables: Each table must be typed double-spaced on a separate page following the references. Tables should be numbered consecutively with Roman numerals in order of appearance in the text and should include a short descriptive title typed directly above and essential footnotes including definitions of abbreviations below. They should be self-explanatory and should supplement rather than duplicate the material in the text. f. Figures: All figures should be numbered sequentially in the text with Arabic numbers and should be referred to in parentheses within the text. Art should be created / scanned and saved as either TIFF or JPEG format, submitted as a separate file, and not embedded in the text file. Electronic photographs, radiographs, CT scans, and scanned images must have a resolution of at least 300 dpi and 1200x960 pixels. Writing any text on the figures should be avoided as much as possible. g. Figure legends: Include legends for all figures. Legends should appear on a separate page after the tables, should be brief and specific, and should include magnification and the stain used. Abbreviations and symbols used in the figures must be denoted in the legend. All manuscripts must be submitted on-line through the web site (http://www.turkjpath.org/submit/). The corresponding author should upload the "Turkish Journal of Pathology Author Responsibility and Copyright Transfer Form" with the main manuscript. The copyright transfer form can be downloaded from "http://www.turkjpath.org/copyright_transfer_form.doc"
Authors will receive a complimentary electronic (PDF) reprint of the article. No hardcopy complimentary reprints are provided by the publisher. Copyright Copyright of an accepted article should be transferred to the Federation of Turkish Pathology Societies. This transfer covers the exclusive rights to reproduce and distribute the article. Authors may make this published article available free on-line provided that the source of the published article is cited and the Federation of Turkish Pathology Societies is mentioned as copyright holder. In such a case, a link to the original article in Turkish Journal of Pathology accompanied by the following statement should also be created: "The original article is available at http://www.turkjpath.org". All articles published in this journal are protected by copyright. Manuscripts, figures and tables published in the Turkish Journal of Pathology can be reproduced, archived in a retrieval system, by providing proper citations. If there are advertising purposes for using Federation's intellectual properties please contact the Federation of Turkish Pathology Societies. The Federation of Turkish Pathology Societies does not accept any legal responsibility for errors, omissions or claims with respect to information published in the Journal. The "Turkish Journal of Pathology Author Responsibility and Copyright Transfer Form" must be filled out and uploaded by the corresponding author with the main manuscript. If the form is not completed as instructed by the primary author, the manuscript will not be considered for peer review. Each author should have participated sufficiently in the work, and the corresponding author should state this. Each field may include more than one author. The corresponding author accepts that all information included in the manuscript is complete and has been agreed on by all authors. Any conflict of interest obtained by financial or personal relationship and/or financial and material support should be reported by the corresponding author. Turkish Journal of Pathology adopts open access policy. Open access to information benefits the humanity as it improves the global value of information. Turkish Journal of Pathology also supports the Budapest Open Access Initiative that was signed on September 12, 2012. Thus, the open access policies adopted by the editorial board of Turkish Journal of Pathology can be found at http://www.budapestopenaccessinitiative.org/boai-10-recommendations. All articles published in Turkish Journal of Pathology are licensed with "Creative Commons Attribution 4.0 International License". This license entitles all parties to copy, share and redistribute all the articles, data sets, figures and supplementary files published in this journal in data mining, search engines, web sites, blogs and other digital platforms under the condition of providing references. Open access is an approach that eases the interdisciplinary communication and encourages cooperation among different disciplines. Turkish Journal of Pathology, therefore, contributes to its own field by providing more access to its articles and a more transparent review process.